A total of 14 titles on offer at the 2016 Caribbean Pre-Cadet Championships staged in Kingston, Jamaica from Monday 22nd to Saturday 27th August; no less than 12 of that number finished in the hands of players from Trinidad and Tobago. In the Under 13 years age group, they captured all seven titles on offer; in the Under 11 years category, just two titles eluded their grasp. The titles to go astray came in the Under 11 Girls’ Doubles and in the Under 11 Boys’ Singles events. Jamaica’s Liana Campbell and Kelsey Davidson secured the former, Guyana’s Kaysan Ninvalle emerged the victor in the latter. 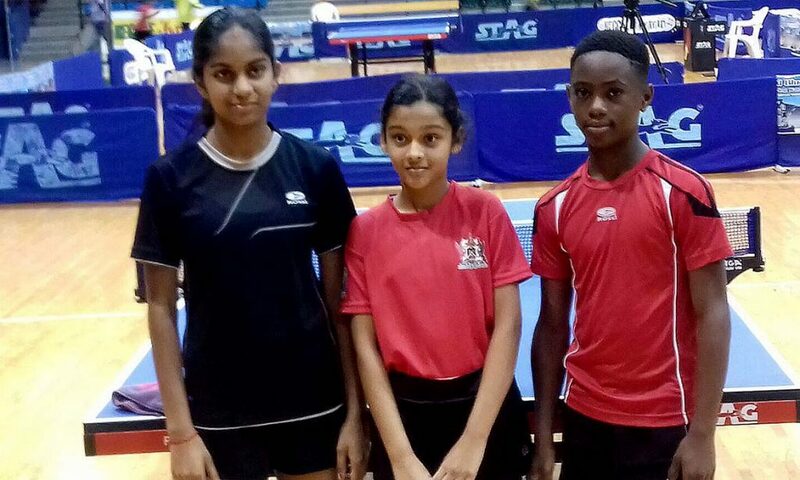 Otherwise there was no stopping Trinidad and Tobago with Derron Douglas and Shreya Maharaj each claiming four titles. Derron Douglas lined up alongside Jamalie Mauge, Jalen Kerr and Vheer Samnarine to secure the Under 11 Boys’ Team crown, prior to clinching three titles in the individual events in the Under 13 age group category. He won the Mixed Doubles in partnership with Shreya Maharaj, the Boys’ Doubles in harness with Messiah Walcott before being crowned the Boys’ Singles champion. Likewise, Shreya Maharaj, in addition to Mixed Doubles success; in the Under 13 age group, she joined forces with Shurja Welch, Rayanna Boodhan and Sheneika Collette to secure the Girls’ Team title. Later she joined forces with Rayanna Boodhan to win the Girls’ Doubles event, before impressively concluding her efforts in Kingston by clinching the Girls’ Singles title. Meanwhile, in the remaining events, Messiah Walcott, Nicolas Lee, Mikhail Dookie and Dujaun Jackson combined to win the Under 13 Boys’ Team title; whilst Priyanka Khellawan, Brianna Solomon, Rebekah Sterling and Imani Edwards-Taylor formed the quartet that emerged as Under 11 Girls’ Team champions. Team success for Priyanka Khellawan; there was also success in the individual competitions. She won the Under Girls’ Singles title, in addition to partnering Nicholas O’Young to Under 11 Mixed Doubles gold; similarly, there were further medals for Nicholas O’Young and Jalen Kerr, they combined to win the Under 11 Boys’ Doubles title. A total of 61 players, 38 boys and 23 girls, took part representing the Barbados, Guyana and Jamaica in addition to Trinidad and Tobago.